NZTA have announced their latest round of cycleway consultations for the Wellington to Hutt Valley Cycling link. You can go to the NZTA website to download consultation documents and make submissions, the main document . As a former Petone to Wellington cycle commuter, I absolutely love the idea that a decent cycleway could be built between the two cities, and I strongly encourage you to make a submission before the 31 May closing date! The following article was first published in the Dompost in January. A list of other articles, opinion pieces and documents that relate to KiwiRail’s Electric Trains can be found here. 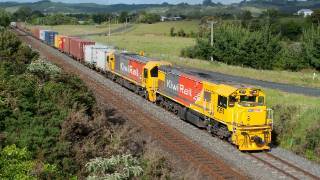 KiwiRail has announced plans to ditch its North Island electric rail fleet and replace with diesel freight engines – a decision derided by environmentalist and Opposition MPs. But chief executive Peter Reidy says the switch will improve reliability and efficiency for Kiwirail’s customers. Plans to replace 16 electric trains – each about 30 years old – which operated between Hamilton and Palmerston North would see diesel locomotives begin operating in phases over the next two years. An electric freight train is to become a scarcity in the next two years. This is a letter published in the Dom Post 31 March, 2016. The Government is systematically destroying the railway asset of New Zealand. Currently many lines are on a maintenance system of”managed decline”. Smaller branches have been”mothballed”and KiwiRail has a policy in many regions of not looking for and refusing work offered. They are closing down the North Island main trunk electrification and taking rail as an option out of the Cook Strait ferries. To be fair, KiwiRail management have been forced into this process of asset stripping by the Government, which has expected them to make a profit when lumbered with permanent way maintenance and depreciation costs that do not exist for their competitors in road transport. This is political manipulation of the worst kind and it treats the people of New Zealand, especially those in the regions, with contempt. In Hawke’s Bay, a consortium of business people, a transport operator and a heritage train operator, supported by Hawke’s Bay Regional Council, presented a viable plan for a short line operation between Napier and Gisborne, KiwiRail has stonewalled this for four years. Free market or the politics of favouritism? Its time we fought to protect our assets. We need to fund rail like roads. Urban road space is finite, valuable and hotly-contested. It therefore makes sense to prioritise transport modes that make efficient use of this space. This does not include cars. If you use a tonne-and-a-half of machinery to shift just yourself at the same time as thousands of other people, you should not expect an outcome other than congestion. Attached is an article I found in the ‘New Zealand Infrastructure Forum’ section of IPENZ’ Engineering Dimension magazine. The contradiction of what MoT say and what NZTA are doing, particularly with regard to the RoNS programme in the context of Tony’s presentation and more generally a lack of funding for alternatives to road, particularly rail. Basically, the presentation outlines how distributed solar energy (solar and wind) will disrupt traditional large power plants and how electric, driverless cars will be used as a service rather than owing by 2030. This will see car utilisation improved from about 4% to about 90% and significantly reduce parking space requirements and improve safety. I’m interested in how NZTA continue to back their projects – the projects are already dubious investments with highly massaged BCRs and incredibly optimistic figures for growth and demand. Add to the mix widely predicted oil supply shocks and falling traffic volumes (Wellington’s had dropped ~4% since 2006) as well as a disruptive paradigm outlined in Tony’s presentation and you’d really, really have to start questioning what the plan really is and why it is proceeding as a matter of priority. How on earth can NZTA and their funders carry on with their highly expensive and dated ‘business-as-usual’ approach to transportation?